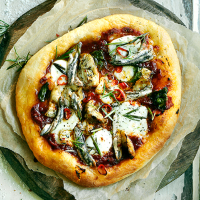 Great pizza dough needs a long, slow rise to make it extra flavoursome and elastic. It’s important to get your oven as hot as possible, to mimic the conditions of its wood-fired cousin. 1. Prepare the dough the night before; put the flour in a deep bowl, make a well in the centre and add the yeast and salt, slowly incorporating 325ml warm water until you have a rough, sticky dough. 2. Knead vigorously on an oiled work surface for 20 seconds, then rest for 10 minutes; repeat twice, using more oil as needed. Put the dough in an oiled bowl, cover with cling film and prove in the fridge for at least 8 hours, or up to 24 hours. 3. Divide and shape the dough into 4 even balls and space out on a floured baking tray. Flour the surface, cover with a clean tea towel and leave to rest for 1 hour, or up to 3 hours, until at room temperature. 4. Preheat the oven to 250˚C, gas mark 9; put a baking tray on the highest shelf. Shape each ball into a pizza base, then transfer 1 to a well-floured baking tray. Scatter with your favourite toppings and slide onto the hot baking tray. Cook for 6-8 minutes, until crisp and golden; repeat with the remaining bases.